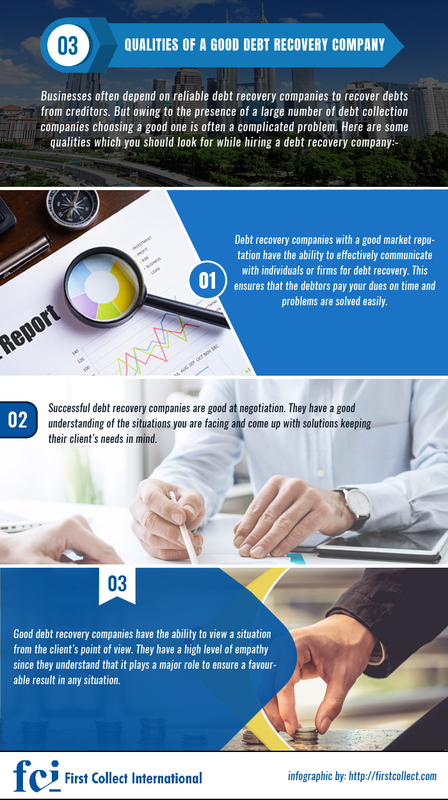 Home / Infographic: What Makes A Debt Recovery Management Company Stand Out? Infographic: What Makes A Debt Recovery Management Company Stand Out? This entry was posted in Blog Debt on September 28, 2018 by adminseo. Companies, no matter which industry they may operate in often hire debt recovery agencies for recovering their debts from creditors. However, choosing a good debt recovery firm with good credentials is often a tricky task. To make sure that you opt for the one which can live up to your expectation, check the communication skills of the company’s staff. This will ensure that your debtors clear their debts on time. Good global debt recovery companies are adept at negotiation. They have a clear understanding of the issues you are facing and will come up with solutions for them. These companies also have the ability to view a situation from a client’s perspective. Therefore they can come up with ideas to deal with it and ensure that all creditors clear their dues within a stipulated time frame as committed to the client.